This year marks the 10th anniversary of the publication of the Macpherson Inquiry report into the police handling of the Stephen Lawrence case. This exhibition, which spans two locations, uses journeying as a metaphor to examine the relevance of the issues raised by Macpherson today. What state are we in 10 years on from the report? Looking back, what have we learned? Looking forward, what are we to expect? These questions are not intended to elicit policy answers. Instead, the exhibition examines artists, responses to these questions in their practice. The exhibition considers two locations: Greenwich, the London borough where Stephen Lawrence lived and was murdered, and Holborn, the legal heart of London. These two locations not only represent the sites of the incident and inquiry, but they also open up a gap between ideas of act and response, local and national, intimate and universal, presentation and representation. The artists’ works consider the journey between these sites in relation to loss, identity, perseverance, danger, exchange and remembrance. Viewers are invited to undertake the journeys physically or conceptually, becoming journeying subjects in the exhibition. While the Milestone exhibition presents an artistic narrative about the journey of the Macpherson Report 10 years on, it also attempts to make available the journey itself. Exhibiting Artists: Brigit Connolly, Ana-Laura Lopez de la Torre, Ekua McMorris, Graeme Miller, Eduardo Padilha, Claire Palfreyman. 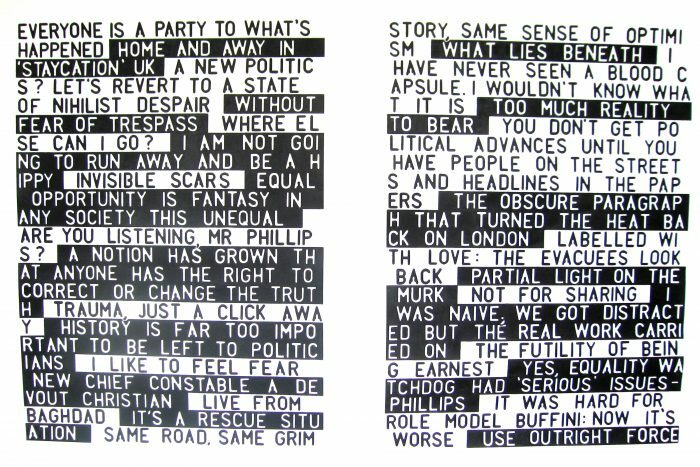 Newspaper headlines collected during 3 month from the moment of receiving the invitation letter by the curator. The headlines where selected after key words from the letter where identify with the topic.